I cleaned the house today, just in case I go out tomorrow. No momma I'm too cute to move! So I was tidying up or at least trying to when Jack decided he wanted to lay down right when I was straightening out the couch cover. He likes to chase the broom, play in the dirt I am trying to sweep up and attack the clothes I am folding. I thought I’d take a couple pictures of him to prove how devious he is. I’m participating in a couple swaps at Crochetville. For those that don’t know, a swap is where you join a swap topic -sweater, snowflake, scarf etc, are assigned a partner, then you make each other whatever the topic is about. You can also add “goodies” to your package, you don’t have to but I think most people do. Like I said, I joined 2 recently; the Shawl/wrap swap and the Scarf swap. I have been so lucky to have wonderful partners; Carolyn and Karen. I just finished washing up the shawls and then I will package them up to send off on Saturday. I’m really excited and can’t wait to see how she likes them! 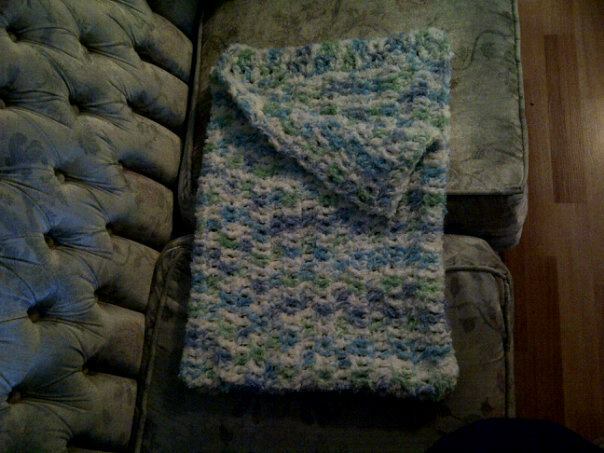 The first is a wrap I made without a pattern; just a simple ripple stitch pattern. I used just shy of 3 balls Bernat Satin in Admiral and almost 3 balls of Bernat Satin in Sapphire and a size 5mm hook. It took me a few weeks to make, only because I had to stop for a week or two because I ran out of the Admiral color and couldn’t find it anywhere. I finally had to get my grandfather to go to Michael’s to get me 2 balls. Over all I’m pretty happy with how it turned out. Oh and it’s longer than it looks in the picture; it’s hanging over the edges of the table. This shawl is off the Lionbrand website called the Half Moon Shawl. I can’t say enough about this pattern. 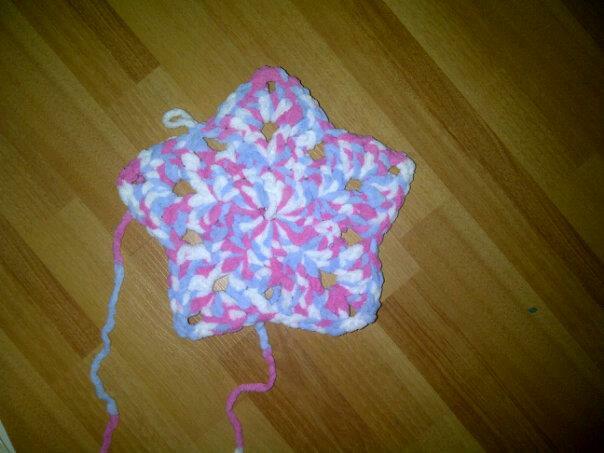 Although it could have been edited and written better, the pattern is SO easy and quick. I think I did half of the entire thing in one night. I used Bernat Softee Chunky in soft taupe and a size 10mm hook. 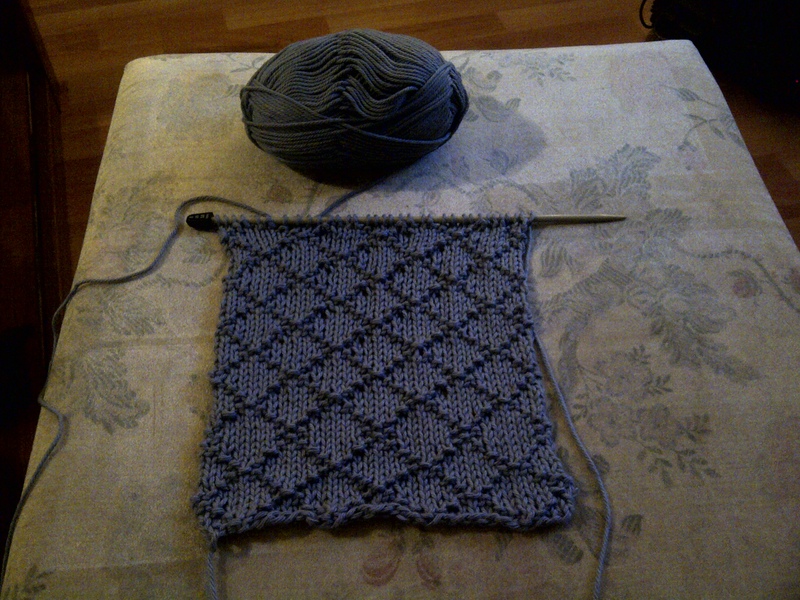 This is the Aphrodite Shawl from the Caron website- there are a lot of cute patterns on that site BTW. 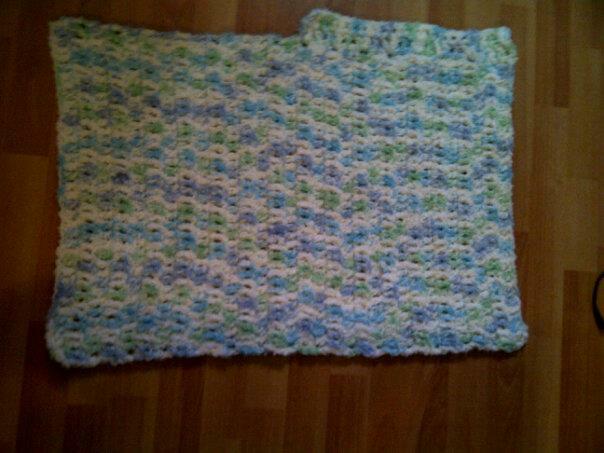 Made in Bernat Baby Sport in Lavender and a size 6mm hook. This pattern could have been written better as well and gave me some troubles. 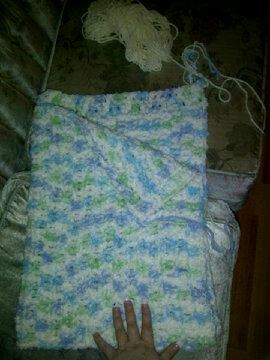 I wasn’t sure if it would be long enough -judging from the pattern picture- so I added a row before the pineapples start. It doesn’t look the same as it does on the model, but I think it is still very pretty. 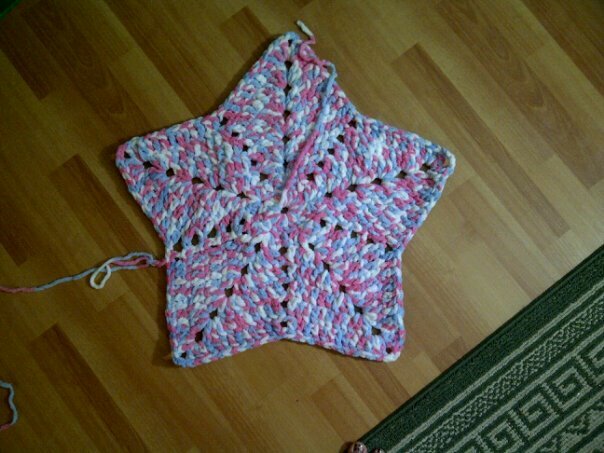 I had to block lightly to help the shape. The swap goodies; 3 shawls, 3 flavoured hot chocolates, a book for her sons, and a cupcake made of soap. I plan on shipping it all out either tomorrow or Sunday, depending on if I go out tomorrow. Mike’s daughter was over this past weekend. We finally have a house where we can have a guest room, which, and I don’t mind, is in my computer room. My computer room is also my crafting room. I have all my yarn and sewing stuff in there as well. So anyway, Tabby was over and she was telling me -as we looked at some of thing I had made- that one of her friends from school had a poncho that her mother had made her. Then she saw this ball of yarn and, picking it up, sighed “this would make a nice poncho”. I took that as a not so subtle hint since every time she saw the yarn she said this to me. Finally I told her that we could look online to see if we could find a pattern she liked and I would make her one, using the beloved yarn of course. So we looked and looked and we found no patterns that she liked. TBH I didn’t like any of them either and I’ve never made a poncho before so I couldn’t even just make up a pattern. Then we came across the Lacy Shell Poncho and she LOVED it, couldn’t stop talking about it. I was having a bit of trouble with it at first -funny how the simple patterns are always the ones that give you a headache. It wasn’t sitting as it should and was ruffling, which it shouldn’t do. 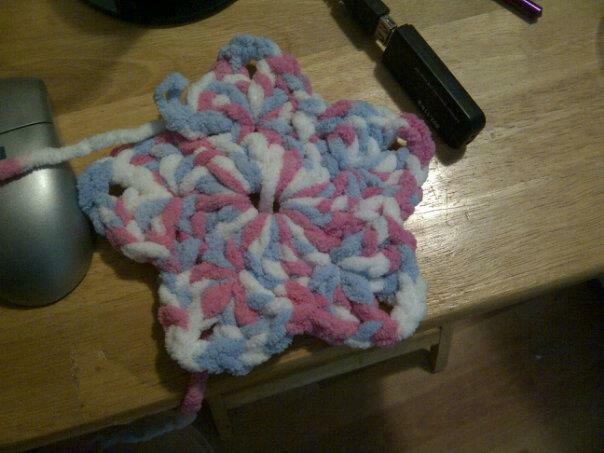 But with some help/advise from someone at Crochetville, I figured it out. I had to change to a bigger hook size. 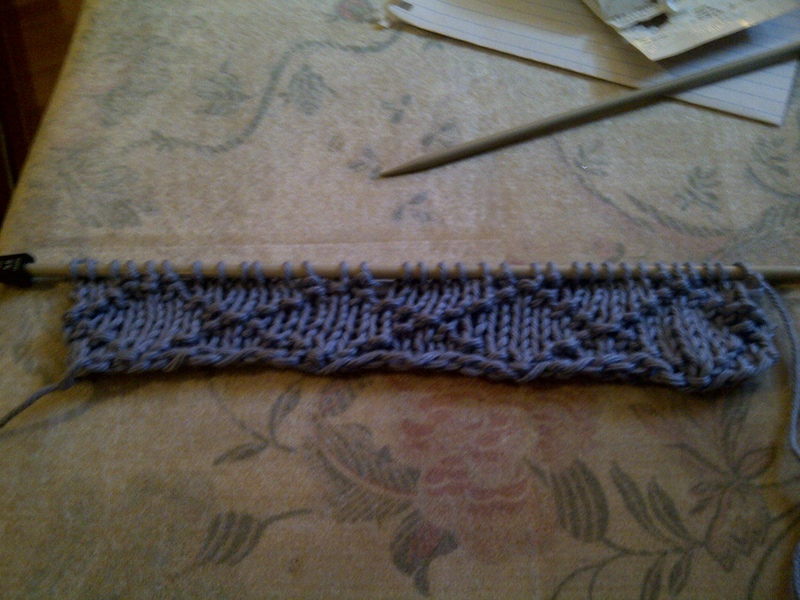 Luckly with this stitch pattern being as easy and fast as it is, it wasn’t a big deal to start over. I’m really liking how it is turning out. 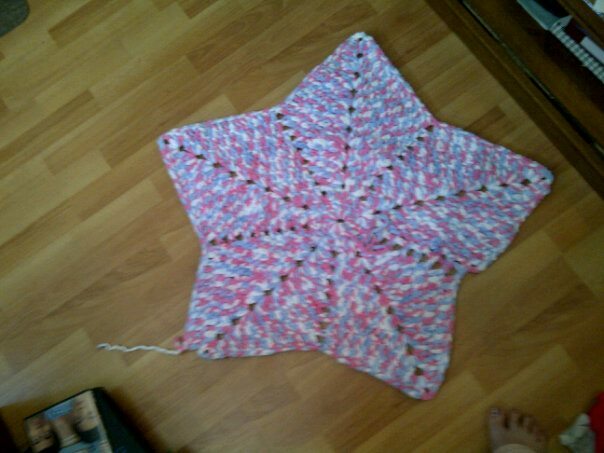 I will probably make a couple more in different colors when this one is finished. My partner said she likes dark blue and I have enough yarn left over from the ripple wrap to make a scarf for the Winter Scarf Swap. I really like this color blue. 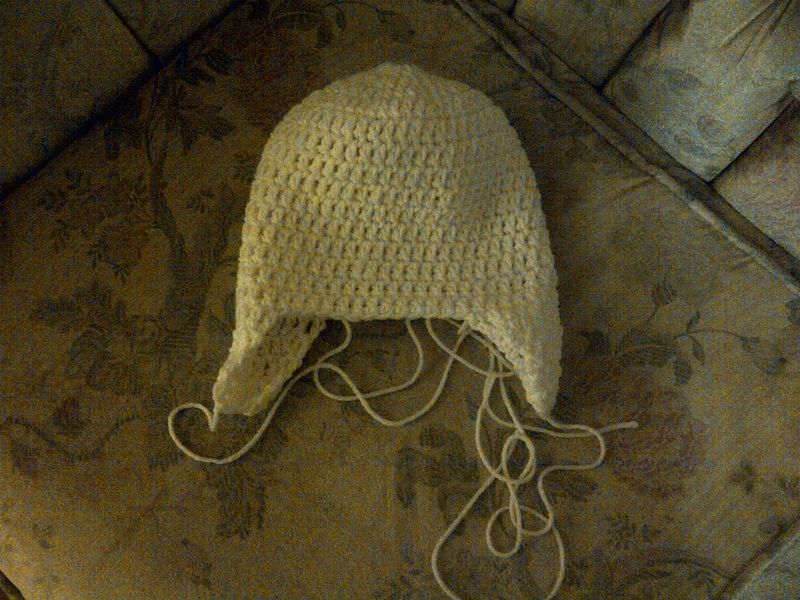 The picture makes it look a bit dull, but the yarn has a nice sheen and is such a rich color.